I had been due to spend this week up in Scotland on a week’s winter mountaineering trip. Unfortunately, the group weren’t able to get their accommodation booked, so the whole week got cancelled. Normally, at this time of year, it can be a bit hit and miss as to wether or not the snow is still around. So you can imagine my frustration when the snow returned with a vengeance only 24 hours before we would have been due to travel north. Ranjit, a good friend, was also due to have been on the trip, so we decided to team up for a day out in the Welsh mountains as a pair to take advantage of the conditions. Heading into North Wales, we hadn’t made up our minds what to do, so the Ogwen valley presented us with the choice of the cold shadowy north faces of the Glyerau or the relatively sunny southern slopes of the Carneddau. Looking north towards Ffynnon Lloer, the slopes of Pen yr Ole Wen seemed to be holding a good amount of snow. That, combined with the promise of a bit of sunshine, was enough of a temptation to drawer us north. Just before walking away from the A5, we bumped into two guys that had just skied down the slopes we were about to head up, and were promised a good day out – in terms of the snow at least. 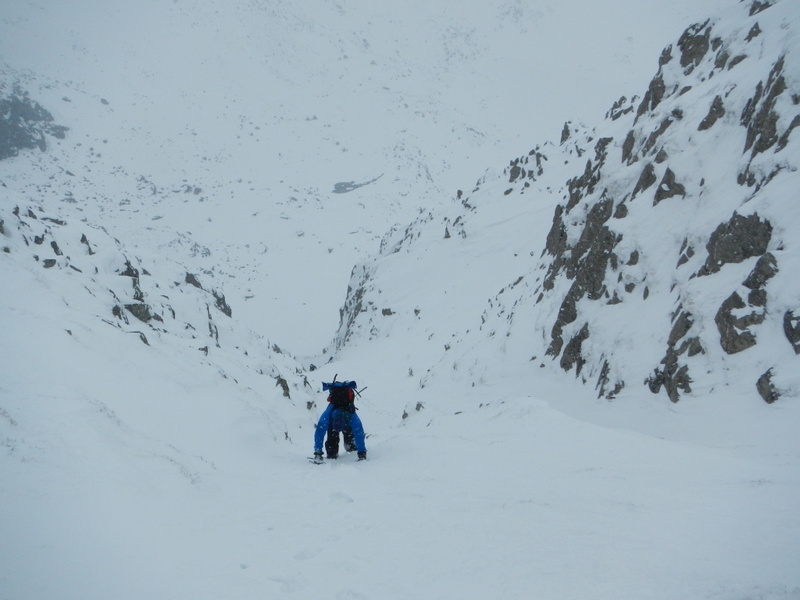 Once up in the cwm, we soon decided that Broad Gully was looking inviting. A group of three guys had also come to the same conclusion. 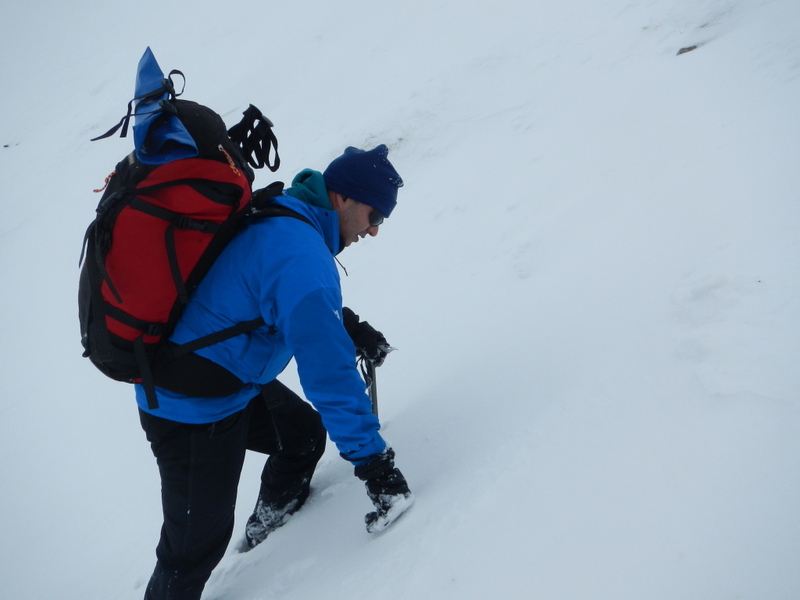 We found ourselves reaching the start of the gulley before the others, making good progress through the variable snow. Much of the snowfield had a layer of thin ice over the top, but underneath was just deep powder, making the going rather slow and laborious at times. At about a third height up this 220m gully is a rock step. It doesn’t look like much but, combined with the deep powder, we struggled to negotiate it. Ranjit hid behind a boulder to get his crampons on, while I was forced to down climb back to him to do the same. The crampons made all the difference, enabling us to get some purchase on the ice covered rock, and we were soon back into deep powder. The rest of the ascent was hard work but straight forward enough. We had planned on stopping for lunch before topping out, but the wind was swirling spindrift in our faces, so we pushed straight on to the summit of Pen yr Ole Wen and round to the col at the top of the back wall. As if by prior arrangement, the wind died and the cloud lifted for 5 minutes to enable us to grab food and drink before heading straight down the Head Wall. The Head Wall turned out to be a very different experience from Broad Gully, with a thicker and more consistent layer of ice. It took a little getting used to walking down a steep ice slope, but it certainly encouraged the effective use of crampons and enabled a relatively quick descent. With the major part of the day behind us, things took on a much more leisurely pace for our descent from the cwm back to the car, with plenty of time to stop and chat and soak in the atmosphere of the Welsh winter in the mountains. Perhaps not quite the same as a whole week in Scotland, but it was great to get back into the clutches of winter for the day.